The Commodore Preble Chapter DAR presented a community service award to Jay Conard on Saturday, March 17. According to Regent Debra Crumbaker, the chapter does not give out community service awards often, but wanted to recognize Conard’s contributions to the community in the area of music. 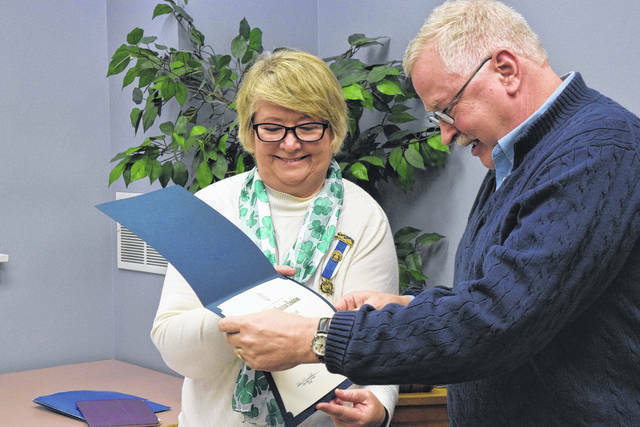 EATON — The Commodore Preble Chapter of the Daughters of the American Revolution (DAR) presented a community service award to Jay Conard on Saturday, March 17. According to Regent Debra Crumbaker, the chapter does not give out community service awards often, but wanted to recognize Conard’s contributions to the community in the area of music. He was nominated by Jo Ann Hoffman, who is both a member of the DAR and part of the Richmond Community Orchestra with Conard. “Last October we had to gather documentation of the community service he has done. It requires people involved in those groups writing letters. We had six people write letters about what he has done for the community. We sent the application into the State. We just found out last month that he was approved,” Hoffman said. The criteria for the award involves: outstanding contribution to community, state, or county in a benevolent manner over the past five years. After Conard was presented his award, several individuals who wrote recommendation letters read portions of their letter out for him to hear. Patricia Brooks, Organist at Eaton United Methodist Church, wrote, “Jay Conard was a public school teacher of music in Preble County and volunteered to be a member of the Eaton United Methodist Church Chancel Choir. When our choir director had a stroke Jay volunteered until she decided to retire. He is the Music Director/Adult Choir Director now. Although he is a salaried employee, he still continues to volunteer at the church. “He is a volunteer playing the French horn in Eaton Area Community Band. He has also conducted some of the songs. He was a volunteer in the Richmond Symphony Chorus for many years. At the Eaton U.M.C. he organized a Wednesday night ‘supper’ for the adults and children participating in the evening activities of choir rehearsals and Bible Study. Many others wrote letters stating their reasons for supporting Conrad’s nomination. Finally, teary-eyed and honored, Conrad stood in front of his friends and colleagues. He said, “At one point, there was another group who asked me to be a part of it, I told them no and that my wife would smother me with a pillow if I volunteered for one more thing. I grew up in this county and I’ve always enjoyed being a part of it. What makes it possible is all of you. https://www.registerherald.com/wp-content/uploads/sites/41/2018/03/web1_Award1.jpgThe Commodore Preble Chapter DAR presented a community service award to Jay Conard on Saturday, March 17. According to Regent Debra Crumbaker, the chapter does not give out community service awards often, but wanted to recognize Conard’s contributions to the community in the area of music.